When you need to teach or explain an idea, you may find greater success by using examples, imagery, and stories rather than defining the idea explicitly. It’s easy to fall into the trap of wanting to be right – using just the right words to make everything accurate. While correct, those words may be lost on their audience. Better to meet them where they are, then clear up misconceptions later. 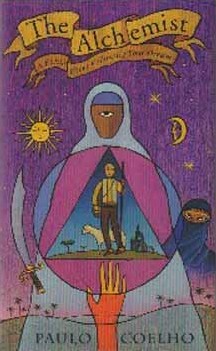 In The Alchemist, we learn from stories within stories. Paulo Coelho doesn’t presume to know where you are in your life (to meet you there,) so we instead watch Santiago, the young shepherd, learn to make his life fit his Personal Legend. The morals still ring true – keeping focus on your true goal, preparing yourself for hardship, and responding to the forces that are more powerful than you. The books leaves you feeling uplifted: Go forth, and live knowing your own Personal Legend is out there. And it doesn’t waste your time telling you what that legend should be – only warns that plenty of others have missed their opportunities through their own pessimism. It’s a quick read, and I enjoyed it — reading the whole thing on a flight from Portland, Oregon to Chicago, Illinois. I never put it down and was excited to find out what happened to Santiago. But when it comes to personal reflection, I’m left feeling like I’ve learned the lessons the book teaches. I see parallels to some Santiago’s situations and my past. And I see treasure in my future. But where I do still fail is remembering that one can always lose track — and perhaps my greatest challenges are still ahead of me. In terms of feel, I can’t help but compare The Alchemist to The Richest Man in Babylon by George S. Clayson. I actually felt more of a ‘lightbulb’ reading the advice on life and money in that book than I did from the Alchemist, but both do a great job of helping you contemplate the struggles and victories humans face using parable and imagery. You should probably read both and tell me if you think they feel the same too. I picked this book for my 2015 reading list because it is one of Maureen’s favorites. She’s a fellow Automattician, and several other books I’m reading this year came from co-workers favorite books.